Summer is here and most of the focus is on Vacation Condo Sales. Although we love to assist our mainland and International clients with vacation property we are here for all of the clients who are also living on Maui and may wish to sell or purchase a home. We have a proven system of marketing for homes sales and are very direct with our clients regarding pricing. Please contact us for a no obligation appointment to learn more about Fine Island Properties VIP Services. Our Affiliate Spotlight is on Hawaii Mortgage Company a regular source for our Newsletter. 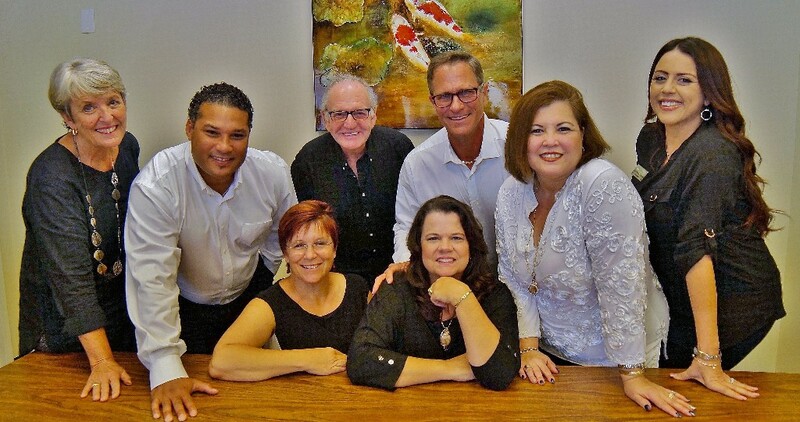 At Fine Island Properties we are rooted in the culture of Aloha, our Maui community, and our professional knowledge. We are ready to serve you and accomplish your goals, with Aloha! Many of you are familiar with the writings of Alan Van Zee as we often site his articles for our Mortgage News section of the Newsletter. This month we thought you would like to get to know a little bit more about Alan and Hawaii Mortgage Company. Why and when did you begin Hawaii Mortgage Company? My background is finance. In 1994 a friend suggested taking that knowledge and applying it to the mortgage industry. Within a short couple of years I was a top producer at the company I started working for. In 1999 I established Hawaii Mortgage Company. In 2000 I met Michelle Van Veenendaal, another successful Mortgage Broker in Honolulu. Soon we merged our businesses. Our company recorded record growth for many years and soon became one of the highest producing independent Mortgage Brokerage firms in the state. I am also happy to report Michelle and I just celebrated our 11th wedding anniversary. The merger wasn’t only business! What are the top tips you would give for first time home buyers? Start the process early, and start by getting pre-approved for your financing before ever looking at a property. You want to start early so that if there are any issues with errors on your credit report or things that can be done to raise your credit score, they can be done without a looming deadline hanging over you. I regularly work with self-employed borrowers and their tax preparers just before the end of the year to insure that newly prepared return shows sufficient income to qualify for the loan they want. Another important reason to get pre-approved early is not only to know how much home you can afford, but what that monthly payment will be. In many cases people qualify for more than they wish to spend each month. Knowing what price range to be looking in will save some heartache from falling in love with a property whose monthly payment you don’t want. Same question but for second home owners/investors of vacation property? The biggest myth is that there is a classification of ownership called a 2nd home/vacation rental. That property can only be either a true 2nd home or an investment property used for vacation rentals. That doesn’t mean that if you vacation rental your new condo you cannot stay there, of course you can. 2nd homes in the eyes of lending are treated as an extension of one’s place of residence. That is why there is a requirement that you spend at least 2 weeks a year living in that property. 2nd home financing has the same rates as one’s owner-occupant property. One aspect many looking to buy a vacation rental are not aware of is that proposed rental income can be used as a basis for qualification. That figure is determined by the appraiser seeing what similar units would rent for on a long-term basis. That means rental periods of 6 months or more. While this figure would be lower than the income derived from vacation rentals, every little bit helps! Is it hard to obtain lending if you are an International buyer? I actually specialize in foreign national financing, so I can happily say it is not hard to get a loan if you are a citizen of another country. The only challenge is that all the required income and asset documentation must be in English. If your documents are in another language, we have a contracted certified translation service to convert those documents. Some lenders may also require that you designate a US citizen to accept service of legal documents, should the situation ever arise. Also, if you are planning on closing your transaction while out of the US, you will be required to sign before a US Notary. They are located at an US Embassy around the world. In many places there’s a 2-3 week wait to get an appointment, so if this is your situation, plan ahead. Do you think rates will increase this year? If so by a little or a lot? Whenever I am asked where I think rates will be in the future, I always reply that if I did know, I would not be still in the mortgage industry, but would be phoning in my bond orders while sitting on the beach with some cracked crab and a drink with an umbrella in it. With all levity aside, while no one can accurately predict where interest rates will be tomorrow, next week or next month, there are clear signs of what to expect through 2017. It is clear that the US and global economies are experiencing pathetic growth. The world’s central banks cannot raise rates for fear of recession. Prior to the BREXIT vote if one were to buy either the equivalent German or Japanese 10-Year Note, you would have earned negative interest. That means that you are paying the government to hold your money. At the end of the bond’s term, you would get back less than what you put in. Post BREXIT, rates of return are even worse. This is important because the US 10-Year Bond is now trading at about 1.500%. Our currency is stable. We are also still perceived as truly the only country in the world that would never default on its debt. So US bonds will always be in demand for years to come. That means that in order to sell these bonds, interest rates would have to be high to attract buyers. Why all of this talk about bonds when the question had to do with mortgage rates? One of the components that factors into mortgage rates is the yield on the US 10-Year Note. If the yield on the 10-year is low, so will mortgage rates. Why should someone from Maui or other islands use the services of an Oahu Mortgage Broker? It may have been impractical 25 years ago to utilize the financial services of a company that was not in the same local as you. But with today’s technology the need to “walk documents into the lender” are gone. With the all the technological advances, providing financing for someone across the world is as easy as doing so for someone down the street. Also being a state-wide company with almost two decades of service, we represent the competitive lenders in the country. We represent over a dozen lenders and can provide just about every type of financing available and at lowest rates available. I stared this business by asking real estate agents to give me a try by sending me their tough loans. Condo-tels, self-employed, foreign nationals, construction, vacant land, these were the types of loans I started off with. In this industry experience does make a difference. While I enjoy learning something new every day, my real asset to my clients is having solved their particular financing issue many times before. Knowing how to get it done can avoid delays, or in some cases save a deal from falling apart. Outside of work what are your favorite things? Being born and raised in Hawaii I still regularly body surf the break at Sandy Beach. Except now in my early 50’s I get a “Howzit Uncle” instead of “Hey Cuz!”. Also my amazing 8 year-old son is an up and coming baseball player. I have been a little league coach for 4 years. I also dedicate a portion of my life giving back to the community. Be it either as a Scouting leader, heading a condo board, or recently as the President of my son’s School Board, I try and pay it forward in gratitude for the successes I have achieved in my life. We appreciate your time and check out Alan’s latest information in this month’s Mortgage News section below. These are the new hot terms in the world of credit that none of us have ever heard of before. What are they, and how does it affect me?A couple of months ago I wrote about how credit scoring (FICO scores) were going to change for the first time in many years. This significant change in calculating one’s score expands on not only if you pay your credit cards on time, but how you maintain your balances. The new system is called Trended Data.There is an old trick to getting a higher credit score that I had previously shared in this newsletter. It had to do with making your payments on your credit card prior to your statement date versus after receiving your statement. This simple change in payment method fooled the FICO algorithms that your balances were lower than they really were. Well, now all that is being thrown out the window.High balances on credit cards will still affect your scores, but what the credit people have determined as a better predicator is how much you pay each month in relation to the minimum required. If you have a balance on your credit card and only make the minimum monthly payment, you are classified as a “Revolver”. If you are someone who uses a credit card as a tool by charging, but pays a larger amount of the balance off every month than required, you are a “Transactor”. Transactors have been shown through research of thousands of credit profiles to be a better credit risk than those that only pay the minimum due. Another huge change in factoring your credit score using the Transactor/Revolver method is how open credit cards with a zero balance factor into your score. Previously, that untapped credit limit helped with your “credit utilization” by adding to the total amount of open credit you had. Now, with a zero balance and minimum payment of $0, the new Trended Data methodology will discount the importance of that piece of credit to your overall score. If you want the highest score possible, utilize all your credit every month and pay more than the required minimum. As an example, if you charge that one tank of gas on a card you never use, the minimum payment on that balance may only be $10, yet you pay the $60 balance in full – that will increase your credit scores as you are now a TRANSACTOR! Trended Data was to be implemented next week, but Fannie Mae found some glitches in how their software as interpreting the new data and has pushed the implementation date back. This delay will provide those wishing to up their scores just a little more time to make payments of more than the minimum due. It seems like this weekend’s newsletter is all about weird terms in the mortgage world. Throttling is hugely important in the mortgage industry because it is one of the greatest influences on how competitive a lender’s rates are. Throttling is the practice of artificially raising rates to slow down the amount of volume coming into a lender. As with any business, there is only so much capacity one can produce at any given time. When mortgage rates drop and lenders are flooded with applications, they will respond by artificially raising their rates to slow the flow. Legally they cannot refuse to accept new loans, but by raising rates, they can discourage new applications. And if there is someone out there willing to pay a higher rate, well come on down! This practice is no different than what we see when trying to book a plane ticket. Why do you pay more at certain times of the year? Because the airlines know they have you. The effects of throttling were very evident this week. As a broker, we utilize over a dozen different lenders. A lender that has been the rate leader for last couple of months artificially raised their rates, and now is no longer competitive. So how much of a difference could there be? This week I got a call from someone looking to see if the rate they received from the bank they applied with was competitive. It turned out I could offer him a rate 0.500% lower than his lender without any additional costs. One-half of a percent is a huge difference, especially for a jumbo loan amount of $700,000. If there is anything I can stress to the consumer or the real estate agent offering a referral to their client – SHOP AROUND. Especially in times where rates are good and lenders are swamped with business. But also keep in mind that throttling works both ways. When rates rise and lenders’ pipelines dry up, they will throttle down and get competitive in order to drive in more business. Page 4 – June’s Sales Unit Volume – Residential sales increased slightly to 96 homes sold while Condominium sales declined to 110 units sold. Land sales remained steady at 13 lots sold in June.Page 5 – June’s Median SALES prices –The Residential median price increased to $657,000 while the Condo median price decreased to $384,000. Land median price increased significantly to $1,200,000 (due to six lots selling on West Maui for $999,000 to $1,770,000).Page 6 – Days on Market, Residential homes = 127, Condos = 114 DOM, Land = 140 DOM. (General DOM Note: this is the average DOM for the properties that SOLD. If predominantly OLD inventory sells, it will move this indicator upward, and vice versa. RAM’s Days on Market are calculated from List Date to Closing Date [not contract date], including approximately 60 days of escrow time. )Pages 10 – 14 – This month’s “Year to Date Sales” numbers compare only the first six months, JanuaryJune 2016 to January-June 2015. Shorter timeframe (monthly) views do not necessarily reflect the longer timeframe trends. YTD – Condo unit sales increased (645 units sold / +30 units sold/ +5% change YTD), average sold price = $635,590 (-4% change YTD), median price = $423,000 (+1%YTD). Total Condo dollar volume sold = $409,955,369 (+1% change YTD). YTD – Land – NOTE: Land Lot sales are such a small sampling that statistics in this property class are not necessarily reliable indicators. The number of Land lot sales increased slightly (81 lots / +2 unit change / +3% YTD change), average sold price = $674,970 (+8%), median price = $510,000 (+4% change), Total dollar volume = $54,672,602 (+11% YTD). Total sales for immediate past 12 months: Residential = 1,125 (with 10.9% being REO or Short Sale), Condo = 1,229 (5.1% REO or SS), Land = 156 (3.8% REO or SS). NOTE: 35.9% of these Sales in the last 12 months have been CASH transactions. For full report you can click here. 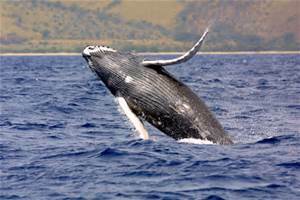 for Maui Listings Search, our Blog, and More! If you know of anyone looking to purchase a home or sell their home please don’t keep us a secret. We will treat your referrals with the experience & aloha they deserve. No Pressure, just Aloha Services. 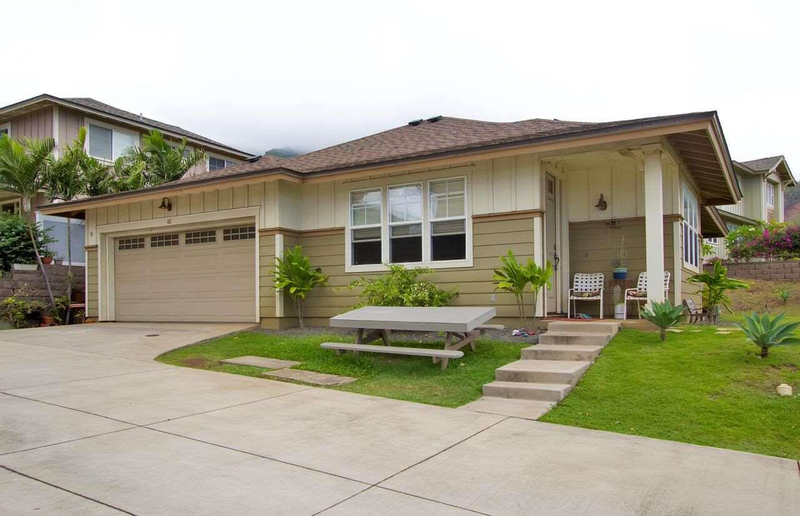 Charming single floor plan Cottages at Kehalani home. Nice Haleakala and some ocean view from this well maintained home features an open plan living area with high ceilings. Lots of windows let in bright light and tropical breezes. The Kitchen features wood cabinets, granite counters, a center island w/sink and stylish black appliances. The master suite is spacious with ensuite bath and a huge walk in closet. The tile work in both bathroom shower areas has a nice accent tile detail. The 2 car garage has a washer/dryer and cabinets. 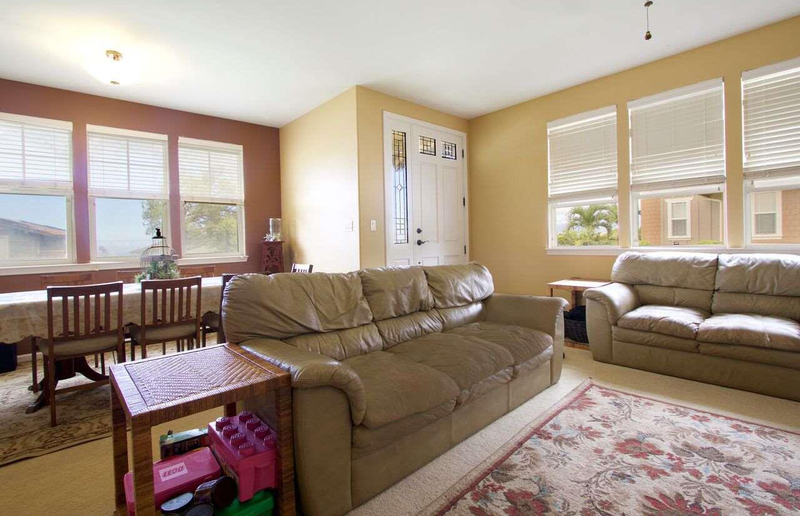 Cottages at Kehalani is convenient to shopping, restaurants, & schools. 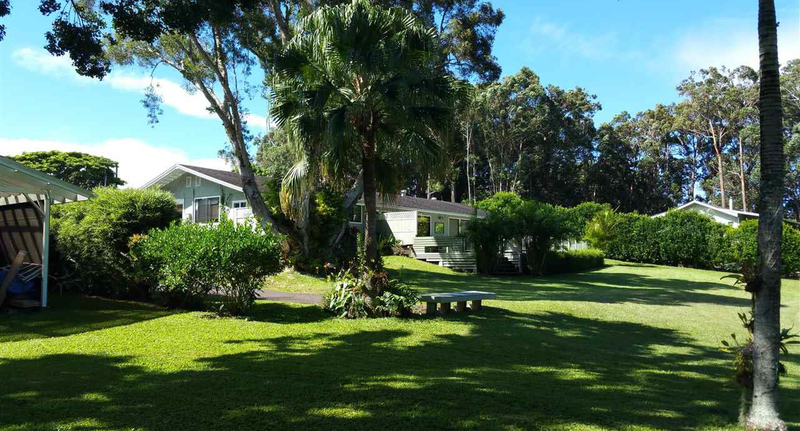 A lush oasis, minutes to Makawao, Hanzawa Store, and Haiku Town. Plenty of room for extended family, or tenants. The property is very private, with hedges all around, extensive lawns, and a hidden meditation hut in the middle of a bamboo grove. The four bedroom, three bath house is divided into a three two, and a one one Mother-in-Law quarters. The main portion has central air for those hot Kona Wind days, or to just insulate yourself from the outside world and cuddle-up in a nice, comfy blanket. The interior of the main house has been renovated in a very tasteful fashion, with granite counter-tops and ceramic tile floors, accent colors on the walls and pretty hanging lights. The two bedroom, one bath cottage and converted storage building are both very quaint and comfortable. The Main House has Leased PV that will be transferred with the sale. Please limit showings to weekends and after 5 PM on weekdays. Click on Link Here for exciting upcoming activites and events on Maui. Click the image for the link to the events. 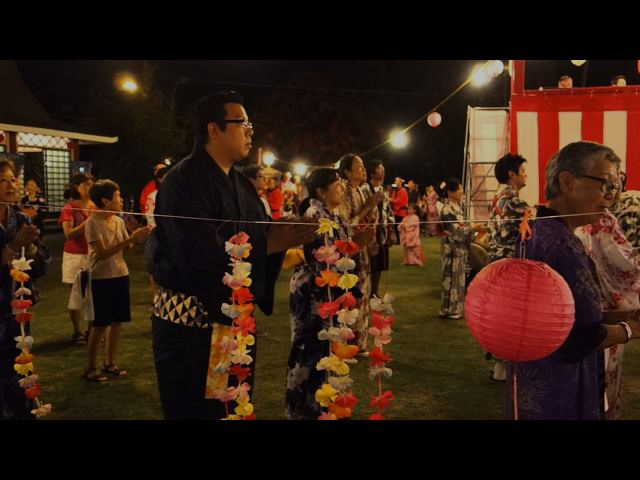 Japanese Obon Dance Festivals July is the time of the year to celebrate the memory of departed loved ones. Dancing and Taiko Drumming is part of this beautiful event. Copyright © Fine Island Properties, LLC, All rights reserved.